Welcome to the CONSULTING-SPECIFYING ENGINEER reader service Web site. 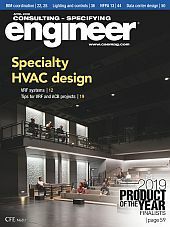 Use these pages to quickly find and request free information on the products and/or services found in the pages of CONSULTING-SPECIFYING ENGINEER. You can ask companies to provide you with more information or link directly to their web site. DELL 160+ HOURS OF TRAINING. ALL TO HELP YOU. FUJITSU GENERAL AMERICA COLD FEET? MAYBE IT'S TIME TO FIND A BETTER PARTNER. RUSKIN MFG BUILT TO EXCEL UNDER PRESSURE. TEKLEEN AUTOMATIC FILTERS INC WE WON'T LEAVE YOU HANGING!! GREENHECK FAN CORP 100% DEDICATED...to OUTDOOR AIR SYSTEMS.